Vitamin D3 is reported to be involved in the regulation of inflammatory processes. 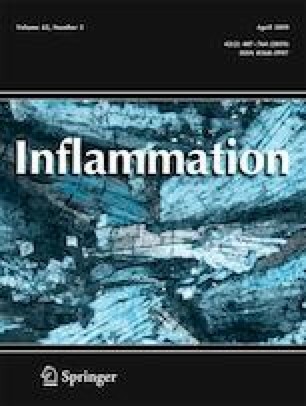 In this study, biomarkers related to oxidative stress and inflammation were investigated to clarify the protective effects and possible mechanism of 1,25-dihydroxy vitamin D3 (1,25-(OH)2D3) on PM2.5-induced inflammatory response. In the in vitro study using human bronchial epithelial (HBE) cells, aqueous extracts of PM2.5 could induce oxidative damage which is characterized by significant increases in production of reactive oxygen species, malonaldehyde concentration, and protein expression of HSPA1A and HO-1. Meanwhile, PM2.5 caused secretion of inflammatory factors (IL-6, IL-8) in the culture medium as well as phosphorylation of p38, nuclear factor-kappa B (NF-κB) inhibitor alpha (IκBα), and NF-κB p65 proteins. Increases in NLRP3 expression was also observed in HBE cells after PM2.5 exposure. However, all these biomarkers were remarkably attenuated by a 24-h pretreatment of 1 nM 1,25-(OH)2D3. Furthermore, 1,25-(OH)2D3 also reduced transcriptional activation of NF-κB induced by PM2.5 as indicated by a significant decrease in luciferase activity in HBE cells stably transfected with the NF-κB response element (RE)-driven luciferase reporter. Taken together, our findings provided novel experimental evidences supporting that vitamin D3 could reduce the predominantly oxidative stress-mediated inflammation induced by PM2.5via the p38/NF-κB/NLRP3 signaling pathway. This work was supported by the National Natural Scientific Foundation of China grant (81402705, 81773414); Natural Science Foundation of Jiangsu Province (BK20140367); Youth Program of Reinvigorating the Health through Science and Education in Suzhou, China (KJXW2017053); and Open project of Key Laboratory of Environment and Health, Ministry of Education (2018GWKFJJ02). The authors wish to thank Andy Kiorpes for his aid in editing this paper.